I love how Kearsley can blend history with the present in such a way that it all flows perfectly from one story to another. The history is such an important piece of the present, setting up situations and characters that draw me right in. 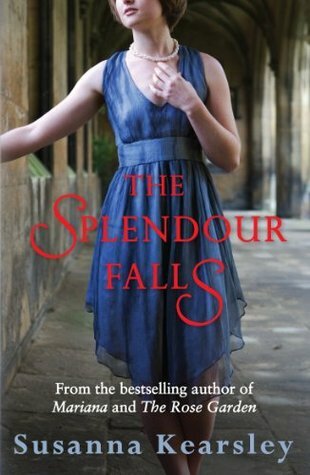 The Splendour Falls not only has that perfect mix of the times, but it has a murder mystery and a missing person case wrapped up in there as well. Emily Braden is convinced by her cousin to join him in France. It will be a vacation for her while he gets some research done. When she reaches the hotel, her cousin is nowhere in sight and no one seems to know where he is. This is nothing new for Emily’s family, as her cousin has a habit of not being the most reliable, so she doesn’t worry too much. She starts getting to know the others staying in the hotel, all the while wondering about her cousin’s whereabouts and thinking about the history of the town she’s staying in. There’s a lot of mystery surrounding the events of the past that still has an impact in the present day. Just like in the other Kearsley novels I’ve read, the characters are unique and amazing. Even Garland, the woman who doesn’t think before she speaks, is a fascinating character to read. Each character has a personality that differs from every other character. It’s easy to see them existing in real life, not just in the pages of a novel. They’re real, with dimensions and flaws, and each one serves a greater purpose in the novel. I might love the way Kearsley weaves history into the present, but it’s her characters that make her books excellent. The murder/mystery/missing person aspect of the novel was very well done. For once, I didn’t see the twist coming. I figured there’d be one, but my guesses were way off. There’s a lot of cover-up and things hiding beneath the surface. I spent half my time reading trying to figure things out. I do wish there had been a little bit more of the historical mystery written about. It’s there to drive the characters along, but it stays mostly in the background. The romance of this book is in the background. It doesn’t play a major role, but it’s always there, hovering at the edges. I’m glad that it wasn’t a major focus. It allowed me to fall in love with every character and with the setting. The Splendour Falls has everything that I enjoy about Kearsley’s novels. When I pick up one of her books, I trust that I’m going to love it. Even if the historical angle doesn’t appeal to you, the characters make this book worth reading. Thank you to NetGelley and SOURCEBOOKS Landmark for a copy of the novel in exchange for an honest review. This entry was posted in Contemporary, Historical Fiction, Mystery, Thriller, and Suspence and tagged Contemporary, Historical Fiction, Mystery/Thriller, Susanna Kearsley, Suspense.